HIV resistance and CTL. NOT! I swear this was coincidence. Last Thursday, after talking about CTL-based selection on HIV sequences, I blogged the musical question, “What other selection pressures on HIV, within a single individual, have been shown?”. One day later,1 a paper in Science offers a partial answer. Fellay, J., Shianna, K. V., Ge, D., Colombo, S., Ledergerber, B., Weale, M., et al. (2007).A whole-genome association study of major determinants for host control of HIV-1. Science, 317(5840), 944-947. There’s a huge amount of individual variation in the outcome of HIV infection. Some people progress rapidly to AIDS, others more slowly, and a very few are “long-term non-progressors” (LTNP) who seem to control the virus for long periods, even without treatment. Over the years there’s been a lot of attention focused on LTNP, and one of the factors that’s been linked to slow progression is a particular MHC class I allele, HLA-B*5701.Different HLA alleles are able to bind to different viral peptide epitopes and act as targets for CTL. The presumption about the role of HLA-B*5701 has been that the particular peptides it binds to, in the virus, include very critical regions of the virus. That means (the reasoning has gone) that as HIV mutates to avoid the CTL that are targeting those particular peptides, the virus gives up a lot of fitness — it’s had to trade, say, replication ability, for the ability to avoid CTL. There were a couple puzzles with that explanation — what’s so special about the regions these particular CTLs targeted? And how come the virus seems to be somewhat inhibited quite early on in infection, even before CTL were thought to be important? — but it was a decent explanation. And it may even be right, but Fellay et al throw another possible explanation into the mix. One striking and largely unexplained difference is the level of circulating virus in the plasma during the nonsymptomatic phase preceding the progression to AIDS. This is known as the viral set point and can vary among individuals by as much as 4 to 5 logs. We aimed to identify human genetic differences that influence this variation. The protective allele leads to a lower VL6 and is associated with higher expression of the HLA-C gene. 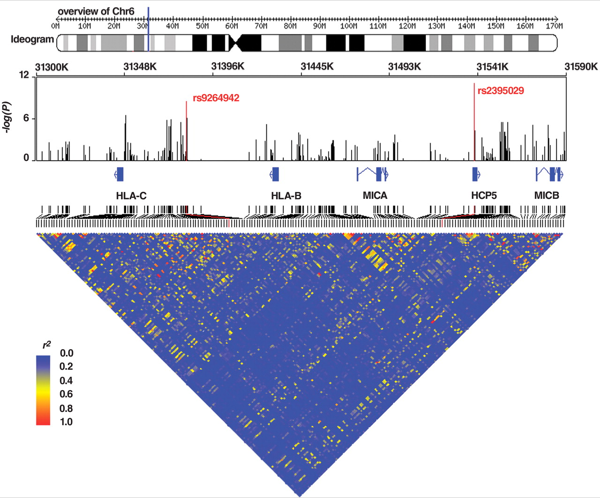 This strong and independent association with HLA-C expression levels suggests that genetic control of expression levels of a classical HLA gene influences viral control. Simple and straightforward, but there’s a potential and very interesting complication. The HLA-C genes are indeed recognized by CTL, but they also interact with natural killer (NK) cells. Could this be a sign that NK cells are important in controlling HIV? Certainly that wouldn’t be surprising, and there are some relatively recent studies that link NK cells to HIV resistance,7 but as far as I know this HLA-C thing hasn’t been previously connected. It may have nothing to do with NK cells, but hey, it’s worth looking at. In fact, as a human endogenous retroviral element (HERV) with sequence homology to retroviral pol genes and confirmed expression in lymphocytes, HCP5 is itself a good candidate to interact with HIV-1, possibly through an antisense mechanism. Moreover, HCP5 is predicted to encode two proteins, and the associated polymorphism results in an amino acid substitution in one of these proteins.A model in which HCP5 and HLA-B*5701 have a combined haplotypic effect on the HIV-1 set point is consistent with the observation that suppression of viremia can be maintained in B*5701 patients with undetectable VL, even after HIV-1 undergoes mutations that allow escape from cytotoxic T lymphocyte (CTL)-mediated restriction. So the bottom line is that, while this large-scale study hasn’t offered direct answers to what makes HIV progress slowly or rapidly, it has raised a couple of really intriguing questions. I’m looking forward to seeing more studies on HIV resistance and HCP5 and, perhaps, NK cells, in the next few years.